Florida is a popular destination for vacationers from all over the world. According to the Orlando Sentinel, nearly 113 million tourists visited the Sunshine State last year. Orlando, the central Florida city that Walt Disney World Resort, Universal Orlando Resort, and SeaWorld Orlando Resort call home, is home to some of the biggest attractions for travelers. It’s estimated that visitors to Florida spent $109 billion last year, but you don’t have to empty your wallet if you’d like to explore a few of Orlando’s theme parks on your next family vacation. 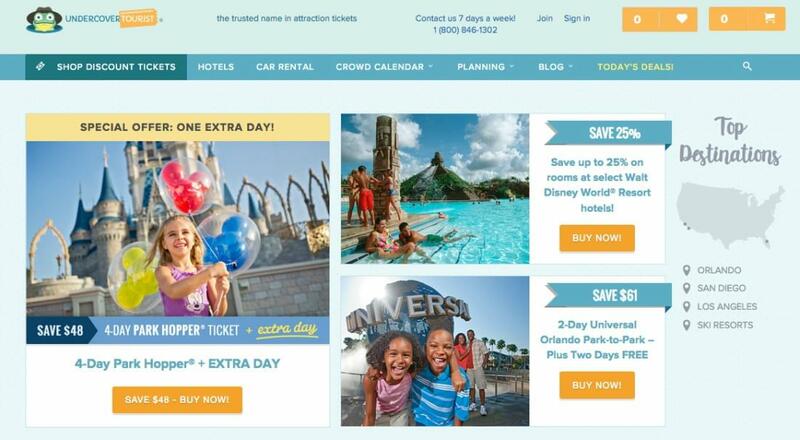 Undercover Tourist, a web-based company founded in 2000, is an authorized seller of park tickets at discounted prices. Ian Ford, Undercover Tourist’s CEO, spoke with RewardExpert about the inspiration behind the company, the tickets and other services they provide, as well as what they have in store later this year. Family vacations tend to be expensive and complicated, Ford said, involving a significant amount of planning on the part of already busy parents. While the company got its start selling discount tickets for Orlando theme parks, you can also save on admission to popular California attractions including Universal Studios Los Angeles, Six Flags Magic Mountain, Knott’s Berry Farm, Madame Tussauds Hollywood, LEGOLAND California, San Diego Zoo Safari Park, and Sea World San Diego when you buy tickets through Undercover Tourist’s website. To make a purchase, navigate to the attraction that interests you and select “Get My Tickets.” You can then choose the number and type of tickets you wish to buy. The savings can be quite significant. For example, visitors to Walt Disney World can save $22 on an adult 3-Day Magic Your Way Ticket when they buy through Undercover Tourist. Add a Universal 3-Day Base Ticket and save another $27 plus an additional $10 on the combo. Taxes are included in the ticket price and shipping is always free. Additionally, Undercover Tourist has a 365-day refund or return policy, so you’re covered in the event you need to cancel or reschedule your family vacation. For those who want to save even more cash, Undercover Tourist offers additional resources for vacation planning. “In addition to great deals on tickets, we offer discounts on curated, family friendly hotels,” Ford said. Visitors can also save up to 50 percent on car rentals when they use Undercover Tourist’s website for booking. While many tourists use the crowd calendars to choose which days to visit top attractions, Ford emphasized that they can also be beneficial if a traditionally busier day is your only option. “Even if you can’t visit during the best times, you can still have a great time if you arrive at the theme parks early, when crowds are at their very lowest, and experience the most popular rides with the shortest durations first,” he said.